Boson makes use of the newest features available to OS X 10.10. 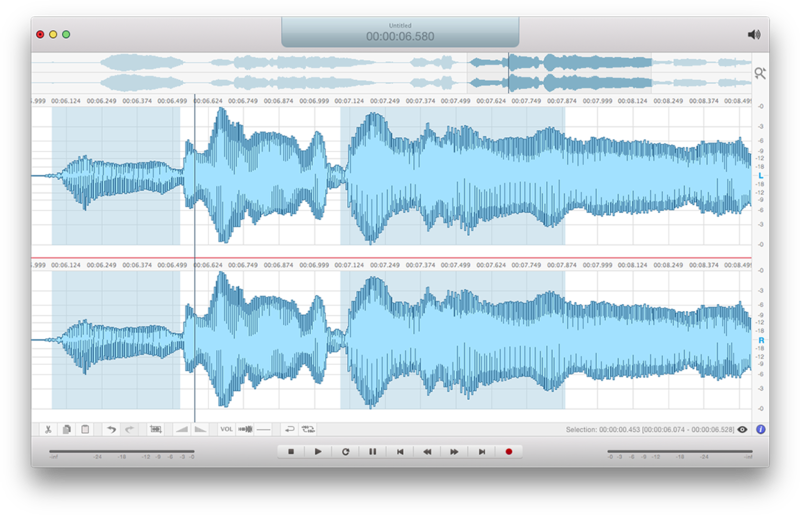 Full Retina capability, low energy usage mode and smooth animations paired with a high end audio editing engine make Boson the goto tool for editing Audio on the Mac! Built in MP3 support makes it easy to create MP3 files and share them with your friends and co-workers. MP3 files play on virtually every device so even people who don't have a Mac will be able to listen to your creations! We love the new interface language introduced with OS X 10.10 - that's why we embraced it when creating Boson! Everything looks and feels sleek and nice. You will love it! 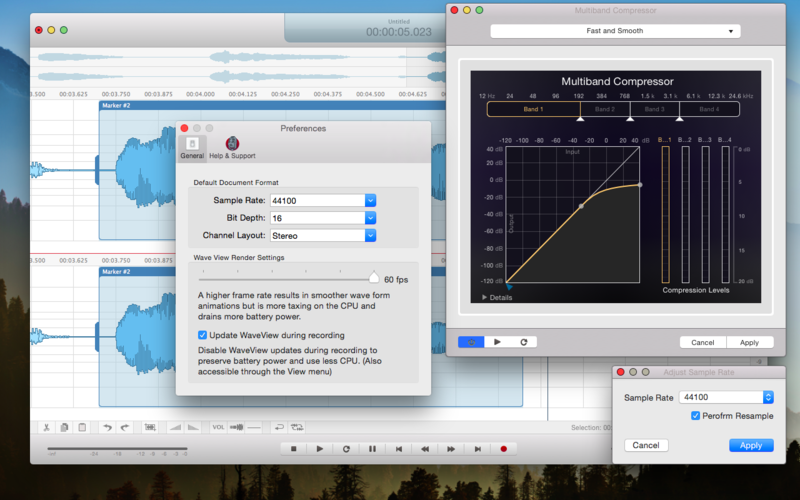 Boson uses a highly optimized audio editing engine and makes use of your Mac's multiple CPU cores. Graphics rendering is accelerated through CoreGraphics and CoreAnimation. Enjoy smooth 60 frames per second when scrolling through the document! 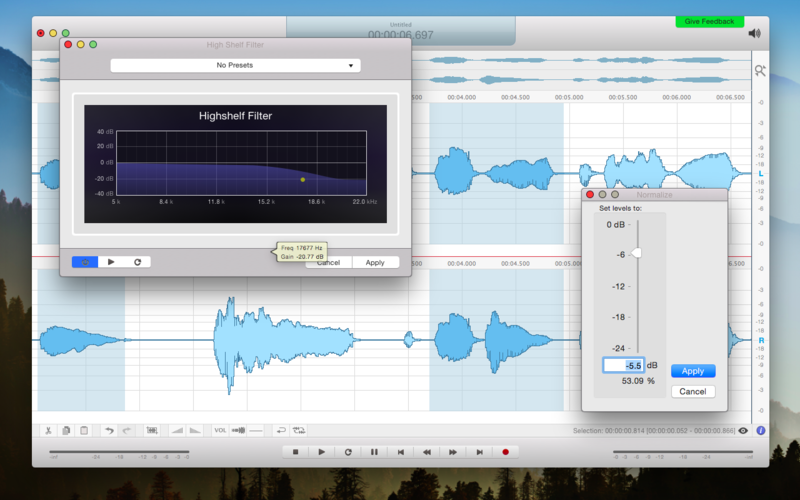 Did you know that Boson allows you to edit audio down at the sample level? Yes, you can select just one sample - from the many thousands samples per second - and just change that one sample! We follow one principle when it comes to designing our software: Principle of least astonishment. If you've ever used another audio editor (or even just a text editor) you will feel right at home with Boson! Everything works as expected. Selecting, copying, pasting, applying effects, etc. No need to learn new complicated concepts - just get the work done! Boson allows you to select multiple audio ranges and to apply effects on them. Simply press and hold the CMD key while selecting audio to add a new selection to your existing ones. Boson comes with the most important audio effect built in. All easily accessible through the 'Effects' menu or the right mouse button context menu. 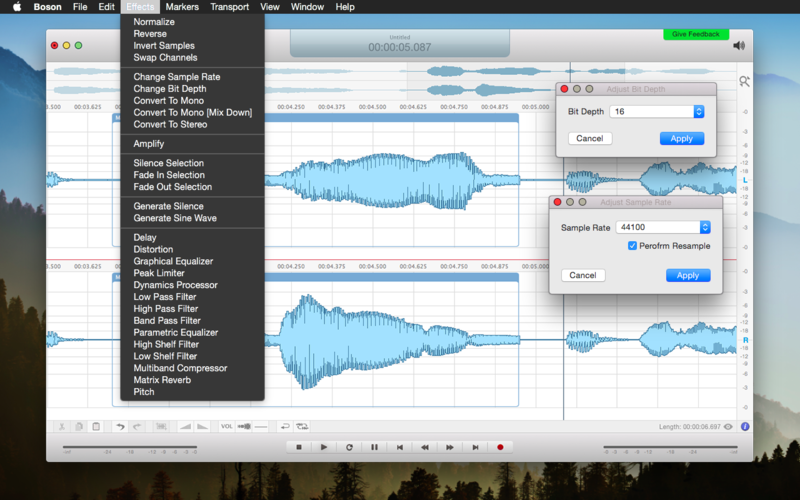 Boson allows you to control every detail of your audio document. From single sample values, over sampling rate, bit depth and channel layout to dynamic range. You can adjust everything and if you don't like it: Unlimited undo and redo are part of the package! Boson follows the long tradition of classic audio editing software. If you know another audio editor you will feel right at home with Boson. But even if you don't: Boson comes with an extensive Manual featuring an introduction to audio editing. Download it from the app store and start editing audio right now! CLICK HERE TO DOWNLOAD THE FREE TRIAL NOW!